What connects Shiite passion plays with Brechts drama? Which of Goethes poems were inspired by the Quran? How can Ibn Arabis theology of sighs explain the plays of Heinrich von Kleist? And why did the Persian author Sadeq Hedayat identify with the Prague Jew Franz Kafka? One who knows himself and others will here too understand: Orient and Occident are no longer separable: in this new book, the critically acclaimed author and scholar Navid Kermani takes Goethe at his word. He reads the Quran as a poetic text, opens Eastern literature to Western readers, unveils the mystical dimension in the works of Goethe and Kleist, and deciphers the political implications of theatre, from Shakespeare to Lessing to Brecht. Drawing striking comparisons between diverse literary traditions and cultures, Kermani argues for a literary cosmopolitanism that is opposed to all those who would play religions and cultures against one another, isolating them from one another by force. Between Quran and Kafka concludes with Kermanis speech on receiving Germanys highest literary prize, an impassioned plea for greater fraternity in the face of the tyranny and terrorism of Islamic State. Kermanis personal assimilation of the classics gives his work that topical urgency that distinguishes universal literature when it speaks to our most intimate feelings. For, of course, love too lies between Quran and Kafka. 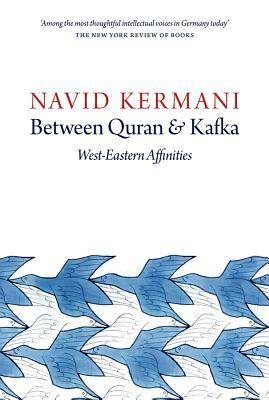 Navid Kermani is a writer and Islamic scholar who lives in Cologne, Germany. He has received numerous accolades for his literary and academic work, including the 2015 Peace Prize of the German Book Trade, Germanys most prestigious cultural award.